I wanted to do a slightly different spin on the on-so-popular Starbucks Sous Vide eggs in the Instant Pot, often called “egg bites”. I have my main go-to, which is my Bacon Cheddar Egg Bites, which are divine, if I do say so myself. But I wanted something that wasn’t just your standard pork product and cheese. 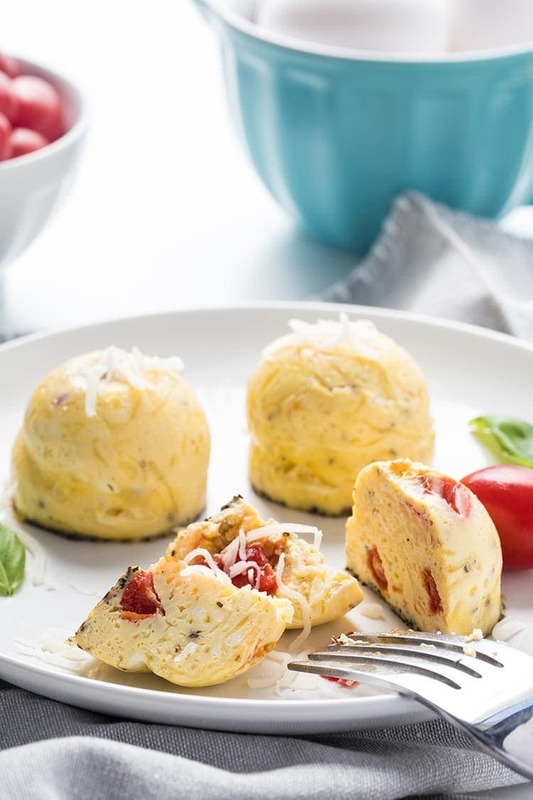 I love the simplicity of the classic Caprese salad, and knew that all of those ingredients are often used in omelettes, so hey, why not try them in some egg bites? And guess what – it totally works! 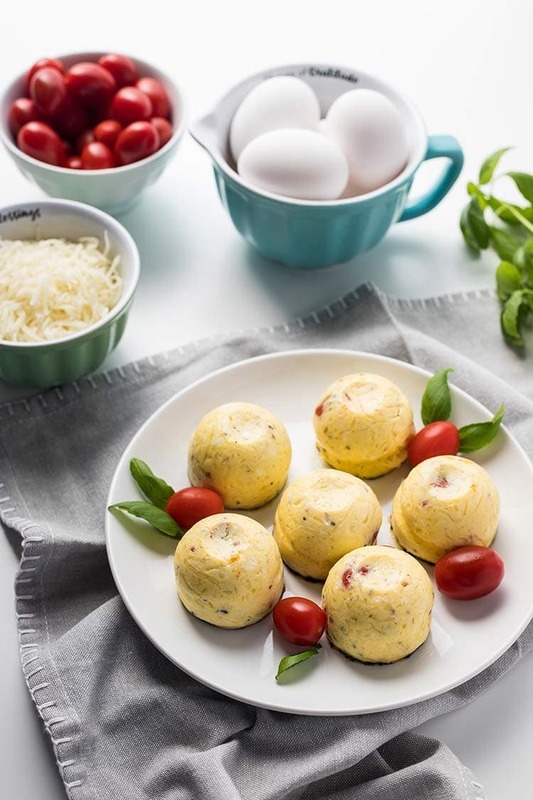 So today I get to introduce you to my Instant Pot Caprese Egg Bites! And they are freezer-friendly, just like everything else you will find here on my blog. I know everyone calls these things “sous vide” egg bites, now that Starbucks has made them famous. But these aren’t actually “sous vide”. That’s a specific method of cooking the egg bites in a water bath held at a very specific temperature. It produces a unique texture to the eggs. Delightful, but hard to replicate with other cooking methods. So I hesitate to name them “sous vide” – we can just call them “instant pot egg bites”. 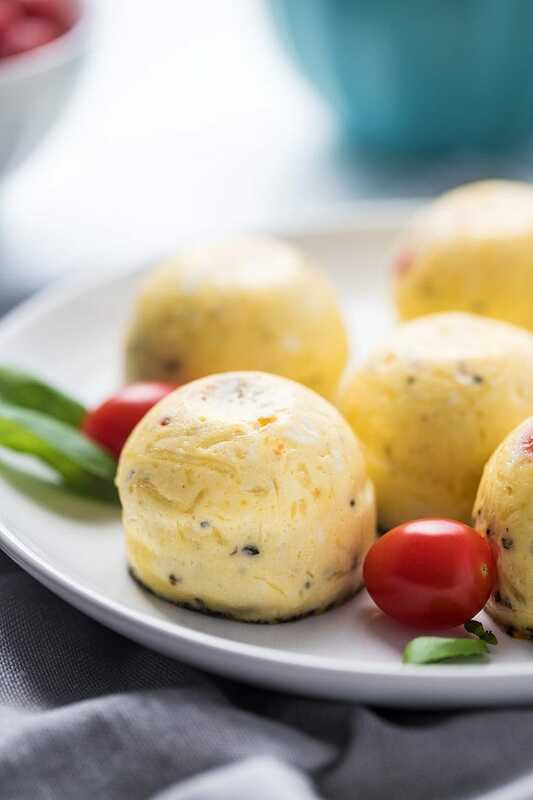 These beautiful caprese egg bites are keto and low-carb friendly, as well as gluten-free (as long as you check your ingredients). For those of you who have made egg bites before, I will spare you the boring stuff – go ahead and skip right down to the recipe now! For those who haven’t made egg bites before, I’ve got some helpful notes for you below. Either way, I hope you will try these, and I hope will like them!! I am amassing quite a collection. I have four that I have ordered from Amazon, and two that I found at Kohl’s that are the Food Network brand. Honestly, I haven’t noticed a difference between brands. They have all worked great for me without any problems. I have two of these, and two of these, but pretty much any brand will do. In fact, you don’t even need to have the egg molds. You can also use individual silicone cupcake liners (place them in a round cake pan for extra stability) or small half-pint mason jars. The molds that I have and that are pictured here are for 6 quart and 8 quart pressure cooker models (they will work in either). They do make a version for the 3 quart models as well, just a bit smaller. The reason I have so many of the molds is because I like to use two molds in each batch so I can get twice the number of egg bites in the same amount of cook time. And I have been known to pull out all three of my pressure cookers to run multiple batches of egg bites simultaneously. Hence, the need for six molds. You can stack the molds on top of each other if you care – just be sure to turn the top one slightly so the bottoms of the cups are offset from the cups on the bottom one and not sitting right in the indentations. I’ve heard that some people have stacked up to three at once. I assume that would require not using the trivet. While technically possible, I haven’t ever tried it, so I can’t say how these would hold up in direct contact with the bottom of the pot. But in theory they should be okay. This recipe assumes that you will be making two molds of 7 egg bites each. I like to fill my molds mostly full, just a tad under completely full. The eggs will puff up quite a bit in the pressure cooker as they cook, but then they will shrink down after you take them out. When I fill the molds all the way full, I tend to get a mess all over the top of the mold and some of the egg drips down into the water below. So, I recommend that you slightly underfill each cup by about a quarter of an inch, give or take. I like to cover my egg bites with aluminum foil while cooking. It helps keep condensation off of them. That said, however, covering them is not technically necessary. You can cook them uncovered. You may just need to dab a little water off the top after cooling. I have also heard people say they have used the plastic lids that often come with their molds instead of aluminum foil. I think that really depends on your brand of mold and what the manufacturer recommends. If you try it, do not snap the lid down – just gently place it loosely on the mold. Remember, those egg WILL expand quite a bit as they cook, so leave the lid loose to accommodate that. I generally just take my egg bites out of the Instant Pot, allow them to cool to room temp, then place them into ziptop gallon-size freezer bags with a label and date, and then carefully place them in the freezer. Be careful not to smoosh them or place anything on top of them until they are fully frozen. Once frozen, you can move the bag or place other items on top of it. I haven’t had any problems with them sticking together, so I don’t usually take the time to flash freeze them individually before putting them in the storage bags. But you can if you’d like. I like to put enough of them in each bag to have enough to last about a week. That way, I can take a bag at a time out of the freezer and put it in my fridge, then just take from that thawed back in the frig each morning for breakfast. Because I pull an entire bag of egg bites out of the freezer at a time and let them thaw in the refrigerator, I am usually reheating my egg bites from thawed. So I just pop them in the microwave for 30-60 seconds and they’re good to go. Theoretically, you could reheat them from frozen, but I’ve never tried it. I would probably suggest doing 1 min on 50% power, then maybe 30 seconds on full power and go from there. If you don’t have a microwave, you can reheat your egg bites right in your Instant Pot! Pour 1-2 cups water into the inside pot, then place a trivet down. 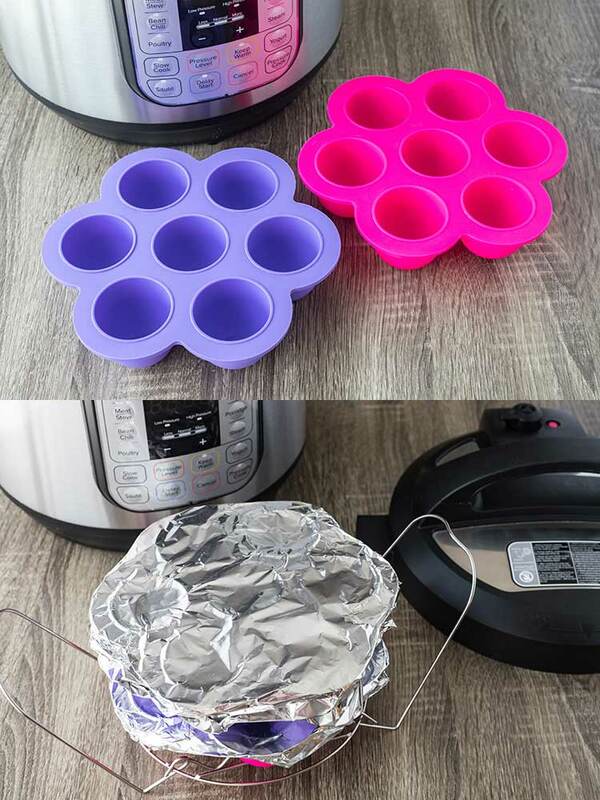 Put your egg bites back into the mold, cover loosely with foil, and then place the mold on top of the trivet. Close the lid and seal the vent. Set your pressure cooker to HIGH, but zero (0) minutes. 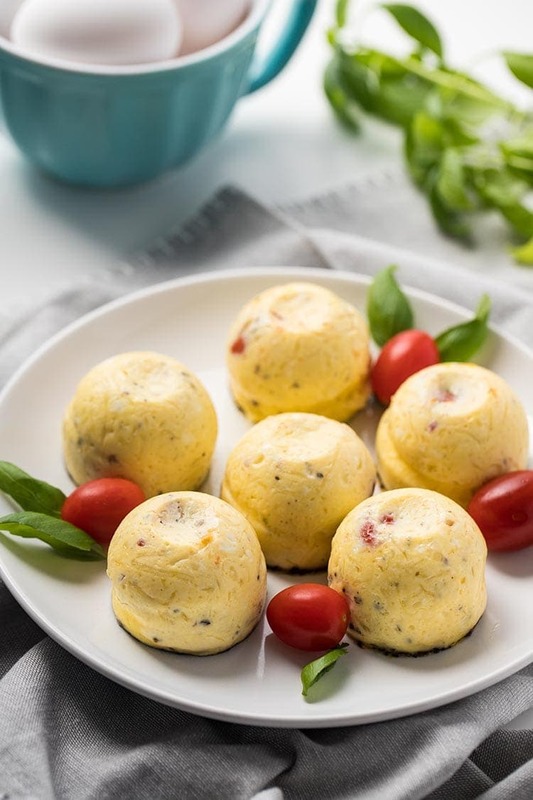 I hope you will give these Instant Pot Caprese Egg Bites a try! I’m rather fond of them, and I especially like that they work for a keto/low-carb way of eating, and that I can make them ahead of time and keep them in the freezer or fridge for busy mornings. 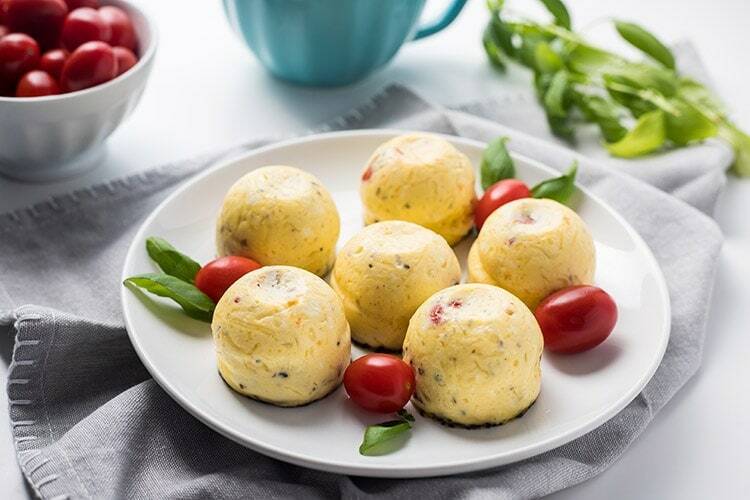 A delightful breakfast twist on the classic caprese salad, these Instant Pot Caprese Egg Bites are so fast and easy to make in your pressure cooker! You can make a bunch and freeze them for future breakfasts! Spray silicone molds or 4 oz. jelly jars liberally with non-stick cooking spray. Set aside. Crack eggs into medium-sized bowl and gently whisk to scramble. Then mix in remaining ingredients. Pour egg mixture into silicone molds or jelly jars, distributing evenly. Cover molds or jars loosely with aluminum foil. Carefully lower second silicone mold and lay it to rest on top of the first mold. Be sure to rotate the mold so the cups are offset (make sure the bottom of the cups on the top mold rest on the spaces between the cups of the bottom mold). If using jelly jars, place second layer of jars, making sure to offset them from the first layer. Close lid, seal vent, and set Instant Pot to cook on HIGH for 14 minutes. Once cook time has ended, allow the Instant Pot to release pressure naturally for 5 minutes, then quick release the remaining pressure. Remove lid and carefully take out molds or jars. You may need to use tongs or chopsticks if space is tight. Place a plate on top of a mold, and holding the plate and mold together, invert, so that the plate is on bottom and the mold is upside-down on top. This should pop egg bites out of the mold. If not, gently press on the top of the mold cups to release. Allow egg bites to cool to room temperature. Place egg bites, not touching, on parchment-lined baking sheet and place in freezer for minimum of 1 hour, up to 4 hours. Once frozen, remove egg bites from tray and place into freezer storage bag. Label and date, then place back into freezer. From thawed, microwave for 30 seconds. To reheat without a microwave, see recipe notes in the blog post.